Call the lab to ensure that we can perform the tests needed. This also gives us lead time to prepare for your samples and expect their arrival. Phone 907-745-8138, or 907-745-8033. Fill out the Plant Disease Submission Form as completely as possible. Place inside a plastic sleeve or zipper-top bag, and place in box with sample. Examine the plant carefully; damage further down may cause symptoms higher on the plant. If possible, include a healthy example, as well as various stages of disease development from early to more severe. Keep samples cool, not frozen. Send entire plants if possible, including roots. Place roots in a plastic bag, and rubber band to keep soil from damaging or obscuring other symptoms on plant. Fleshy specimens (such as potatoes or fruit) should be as firm as possible, with early to intermediate symptoms. Place in paper bags (they will rot in plastic bags). Pack box with sufficient newspaper or paper towels to absorb any leaks, and to protect samples. Wrap samples in dry paper towels or newspaper. Do not add moisture, as samples can rot in transit. Place wrapped samples in plastic zipper-top bags. Pack remainder of box with newspaper to protect samples. Collect specimens as close to mailing as possible, keep cool, and ship by fastest method available. Ship early in the week (Mon.-Wed.) to ensure it arrives before the weekend. 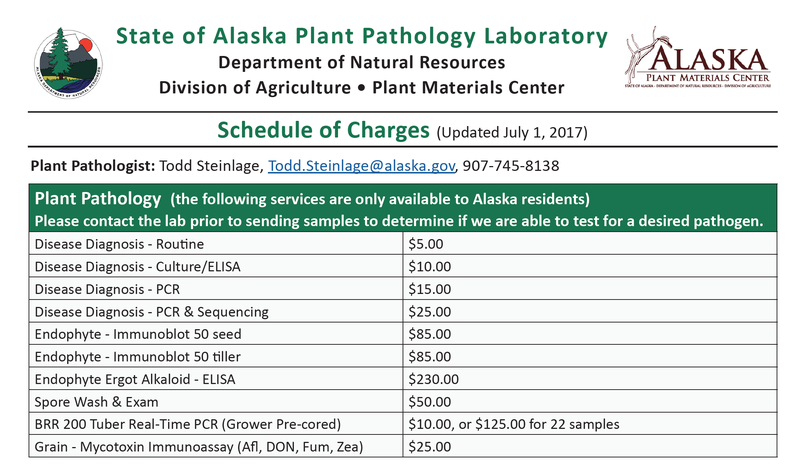 Delays can result in samples rotting, or being overgrown with other organisms; this may make accurate diagnosis difficult or impossible. Digital photos may also be emailed to aid in diagnosis. You may also download these instructions by clicking the link and saving the pdf.